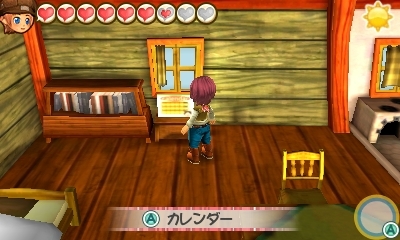 The calendar inside of your farm house will list the festivals and birthdays that take place in the three towns. It is always located in the upper-left corner of your house regardless of how you have remodeled your interior. You can page through four seasons worth of upcoming events. The icons on the calendar dates indicate what kind of event takes place on that day: a slice of cake is someone's birthday, a yellow star is cultural festival, and a yellow grown is a competitive festival. Giving someone a gift on their birthday will give you a boost of Friendship Points (FP) compared to if you gave the person a gift any other day of the year. For example, giving someone a gift they love is normally +500 FP but on the person's birthday it is +2000 FP. The cultural festivals are either specific to a town or can be a game festival that involves all three towns. You'll be going to a town to see an event take place. With a game festival, you'll be assigned to a random team of villagers to challenge the other teams. A competitive festival is when your farm experience is tested. You'll be competing against three other villagers for festival victory. You can see the criteria for winning the contest by selecting the date on your calendar and pressing the Y Button on your Nintendo 3DS. Later in the game you'll be able to switch the calendar view from a monthly view to an 7-day agenda view.